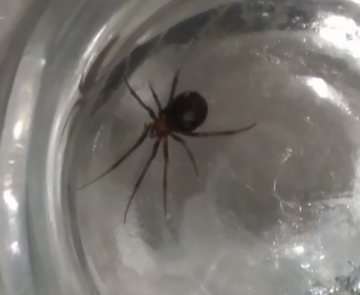 A suggestion would be a Steatoda species, for the Spider ID request posted below in a pint glass. I'm afraid the images are too low resolution and unsharp to make any sensible reliable suggestion. As a follow up, to give an idea of size/scale, the spider is in the base of a standard pint glass. 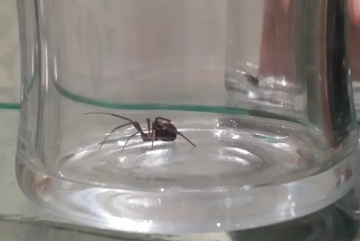 I found this spider in my bathroom in my Dumbarton (West Dunbartonshire) residence (Location - NS403750) on 14th April. I would be most grateful for any assistance with ID. This is one of the house spiders Tegenaria species. They can't be identified to species without examination under a microscope, but they are harmless and occur in most buildings in the country. 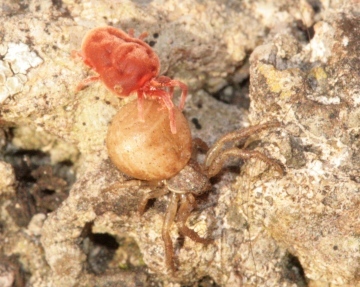 The spider is one of the crab spiders, looks like an Ozyptila species, but it is not possible to make any reliable sugegstions as to the species. 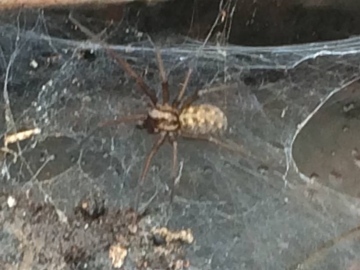 I work with water in Glasgow, Scotland and find these spiders under fire hydrant lids, they spin massive webs which seem to have several layers to them! I assume they like damp conditions due to the location I find them! I am noticing more of them and they also appear to be getting substantially bigger! Sorry for the poor quality photograph but I'm kind of terrified of them but I'm curious at the same time. I was taking photos of this mite and followed it along the wall where it climbed onto this unsuspecting spider. Unfortunately that is when they both let go of the wall and disappeared into the undergrowth below. I was wondering if it possible to say anything about the spider's identity. From the mite's size I would guess the body length is around 5mm.